Your power just went out. What do you do after you contacted the power company? Duke Power is reporting several outages in our area. First: Unplug all of your appliances and leave a light turned on, this prevents a possible power surge from ruining your electronics. Second: If your home is without heat your plumbing could become frozen. To prevent this let a trickle of water stream from your faucets. 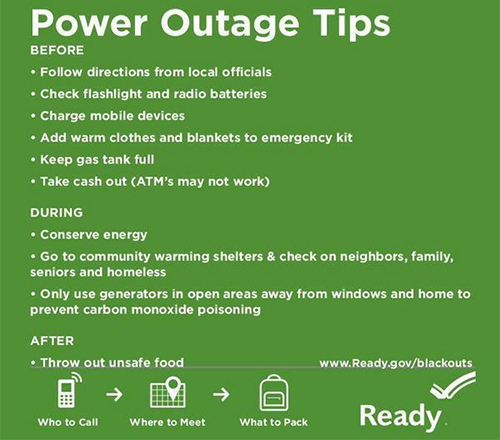 Third: If you own a generator use it safely and never operate it inside. Plug your appliances directly into the generator, do not directly connect your generator to your home. Fourth: If you think this will be a prolonged shortage you may want to relocate to a shelter if you feel you can get there safely. Fifth: If you lose your heat you can use a regular wood stove or fireplace to stay warm but DO NOT USE kerosene heaters, BBQs, grills or any outdoor type heater inside. Sixth: Keep your refrigerated foods fresh by limiting the number of times you open the refrigerator. To keep food fresh longer fill the refrigerator with frozen water.